A blog isn’t just a place to put your thoughts or promote your business. It can be a site that changes people’s lives, it can start a movement, or it can alter your own life completely by helping you fulfill a dream, become a writer, or build your business by creating a solid foundation for your purpose. 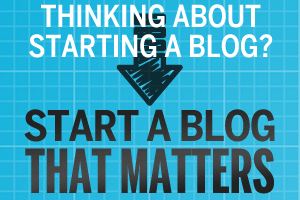 We are absolutely thrilled to share Corbett Barr’s course, How to Start a Blog That Matters with you today. Claim to Fame: Creator of 3 amazingly successful blogs: CorbettBarr.com, Think Traffic, and Expert Enough. Corbett understands how a blog can change the lives of both the blogger AND the reader. His course combines tones of written material, checklists, and video. He really embraces all the ways we learn and breaks down the material into actionable steps that we can complete in a week. And let’s be honest, when a blogging course is written by a man who has three uber-successful blogs and has coached dozens of other bloggers to be just as successful, why wouldn’t you want to take it? What makes Corbett’s course unique? Corbett doesn’t just talk the talk, he’s walked the walk. This course is based on the exact strategies he used to launch and build his own blogs, which now attract tens of thousands of visitors a month. He writes each weekly chapter around an action plan so that you’re not just learning, you’re doing! (And honestly, isn’t that where we all fall short?) Corbett tackles the whole process of starting a blog that matters from picking your topic to launching your blog to expanding your reach through webinars, podcasts, and Youtube. As a bonus, he explains how to bring in your first dollar from your blog. Bonus videos! As if the 13-week program and its 8 hours of video wasn’t enough, he throws in 4 bonuses. There are two, advice-packed videos with Danielle LaPorte and Leo Babauta of Zen Habits. The other two videos are case studies with bloggers Corbett has coached personally. If you want to grow your business’s exposure, start a movement, or launch a writing career, Corbett Barr’s course, How to Start a Blog That Matters, is the best one out there. Written by a master and focused on action, this course will transform your blog into something powerful both for you and your reader. It’s time to make a difference in the world. Are you ready?